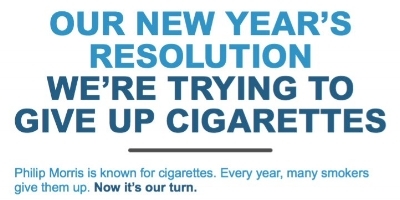 As part of its New Year’s resolution, tobacco company Philip Morris has launched an aggressive anti-smoking campaign against its own product – urging consumers to give up cigarettes as the company itself commits to doing the same, with a bold ambition to “stop selling cigarettes in the U.K.” The brand explains that this untraditional call to action is necessary for the brand’s future, with CEO André Calantzopoulos stating, “We have a duty to our business that we ensure we have a viable business going forward, so we’re investing in alternatives so we provide a future for them as well.” The company is hoping consumers will join it in this pivot. To get the word out, Philip Morris ran an ad in several U.K. newspapers sharing the brand’s new commitment and encouraging readers to join the smoke-free movement. Additionally, to support smokers during the challenging task of quitting, the company created a ‘Smoke Free Future’ website and campaign which provides smokers with information on quitting and cigarette alternatives. The brand is also seeking approval from the government to provide information about quitting and cigarette alternatives directly on its cigarette packaging – placing information front and center in the hopes of creating behavior change. As the company hopes for a higher demand of smoke-free alternatives, it has begun to research and expand the availability of new alternative products in the UK. This shift has long been in the works, with Philip Morris spending more than £2.5 billion on research and development over the past decade to develop smoke-free alternatives. Although critics may focus on the fact that Philip Morris has no set date for total removal of cigarettes from its product line, the company’s own CEO explains they did not “make this type of statement lightly”. The company hopes that by sharing its own commitment to quitting, their consumers will be encouraged to do the same, creating less demand of cigarettes and in turn, more demand for less harmful alternatives. The company’s manifesto explains, “Society expects us to act responsibly. And we are doing just that by designing a smoke-free future”. Pundits will certainly be tracking this potentially transformational moment for the brand – and if it succeeds in becoming smoke free along with its consumers.